If You Did Not Publish About Your Student Affairs Program or Service - Did It Happen? About this time of year, we can feel that spring is in the air (for better or worse!). We all understand the complexities and chaos that swirls around spring banquets, end of year events, outdoor intramurals, graduation, etc. Many of us also are too familiar with the allergies that come with the timing of the annual blossoming and growth of our natural landscapes. With the constant borage of events and pollen, there is evidence that change is in the air! We know change, in some shape or form, is also taking place on many of our campuses. We have seen students (and staff and faculty) inspired to advocate and demonstrate to make their local and national communities better through the #MeToo, #Enough, and #Dreamers movements and support efforts. I have been encouraged by the students who continue to articulate their stories and inspire others to take action to better the world we live in. Our students’ ability to advocate for and mobilize change in an organized and systematic way is something that might be new on some of our campuses but is not something that will fade anytime soon. I find our students’ passions to enhance our communities encouraging to say the least. 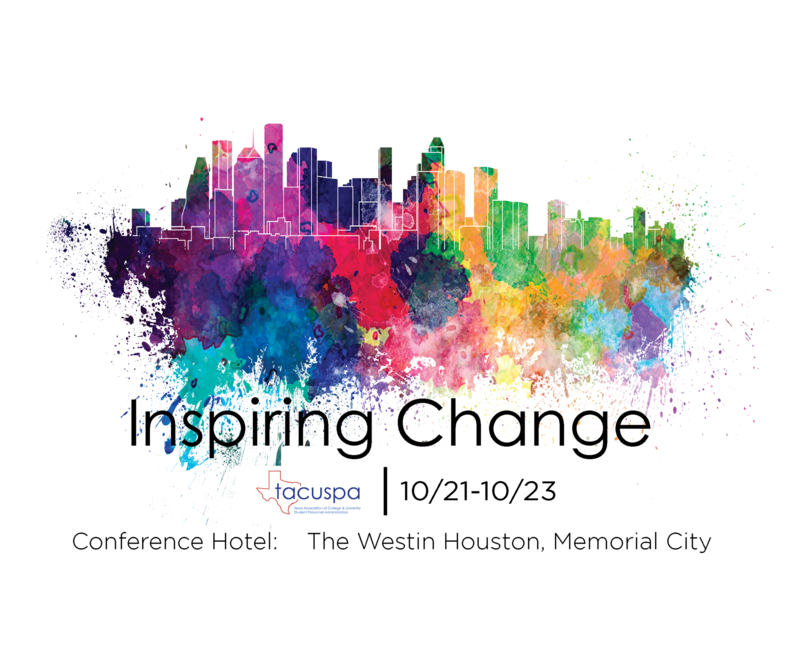 This fall, TACUSPA will dive into many of these topics as we consider what it means to “Inspire Change” at the 2018 TACUSPA Fall conference in Houston, TX October 21-23. Feel free to visit our webpage for more information: http://www.tacuspa.net/Conference as it becomes available. We look forward to you joining us in Houston and engaging in the conversations that create inspiration and motivate action. Donations are being accepted for the TACUSPA Foundation Silent Auction! Proceeds support graduate student scholarships and TACUSPA Fellows. We challenge you to pay it forward and pledge to give at least $1000 between now and TACUSPA’s 100th Anniversary Celebration in 2025. 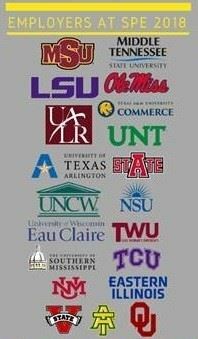 TACUSPA has contributed to the profession and professionals engaged in Student Affairs work since 1925. All proceeds from this campaign will be used to provide scholarship and fellowship opportunities for graduate students and new professionals in the field of Student Affairs. There are a variety of flexible payment plans to fit your needs. You may decide to give $125 a year over the next eight years or start with a smaller amount and increase it over time. Pick the plan that works best for you. Participants making the pledge will be recognized on the newsletter and on the wall of honor at annual conferences in October of each year. Upon completion of a $1000 total gift, donors will be recognized as members of the Century Club. To make a pledge, send the attached form to Deidra Stephens at Deidra.Stephens@mccombs.utexas.edu. To donate, go to http://www.tacuspa.net/Foundation. Many higher education institutions in Texas are focused on student success technology to communicate with students through nudging-based messages. This software is also helpful to predict which students are likely to do well and which students need student success interventions like tutoring and mentoring. Despite the fact that these software systems contain data to help student affairs practitioners and faculty perform the tasks of their position with more impact, student success technology companies usually only provide training and support from an enterprise level and not a higher education practitioner’s level (day-to-day operations). Throughout the existing student affairs and higher education literature, student success technology systems (Civitas Learning, the Education Advisory Board’s Student Success Collaborative, Hopson’s Starfish Software, etc.) are utilized to perform one or two large tasks for an institution (i.e. - tutoring or advising). Typically these software systems possess 10-15 additional functions that are not utilized by institutions that would be essential to their operations. Usually, these software systems are managed by one person or a group of people, but it can be difficult to manage and market the software on campus, provide technical support, assess, and to learn how to “hack” (think beyond the surface functions to perform additional tasks). The following infographic was created for individuals who have or are considering student success technologies for their campus. If you are interested in student success technology research and best practices, send Dr. Jennifer T. Edwards (TACUSPA Director of Research) an email to join future statewide meet-ups and Facebook Live sessions - jtedwards@tarleton.edu. as a TACUSPA Research Expert for research methodologies. in TACUSPA Twitter Chats and Facebook Live sessions. If you have any ideas or if you would like to volunteer, please complete this form: https://tinyurl.com/TACUSPAResearchInterestForm . If you have any questions, please contact TACUSPA - Director of Research, Dr. Jennifer T. Edwards (@drjtedwards). Denton, Texas hosted SPE for the first time in its history, and the relocation went great! The University of North Texas hosted SPE on campus this year, and the Host Committee is happy to announce that SPE will be back in Denton for 2019. Twenty institutions and forty candidates helped make SPE the success that it was. We look forward to seeing those institutions return and those candidates multiply. We would also like to thank Caldwell Gregory for sponsoring the opening reception, Southwest Contract for providing the continuous beverage service, and Foliot Furniture for sponsoring the closing banquet. During placement season, why not cast a wider net? SPE offers a personalized, affordable experience for candidates and employers alike. If you have questions about next year’s SPE, please contact us at southernplacementexchange@gmail.com and keep an eye on southernplacement.org for updates throughout the year. 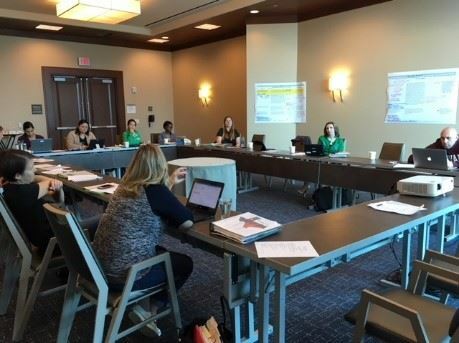 The TACUSPA board met in Houston from January 31 – February 2 for a strategic planning session, board meeting, and tour of the 2018 conference hotel! Read on for highlights of our time together. Strategic Planning Session: The board of directors met and reaffirmed our commitment to the retention and recruitment of our members and to provide quality educational and professional programs to our members. Additionally, the board conducted a SWOT analysis from responses of the most recent association needs assessment (see themes below). In addition, the board collaboratively reviewed the progress of the 2015 – 2020 strategic plan and made adjustments where necessary. Ideas for program improvements and additions were discussed. Board meeting: February’s board meeting covered many topics such as 2018 conference, foundation, elections, Moorman fellows, and research. All board meeting minutes can be found on the TACUSPA website once they are approved at the following board meeting. 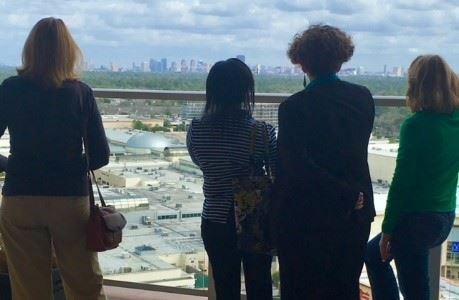 Conference hotel: We got the opportunity to tour The Westin – Memorial City Hotel. The hotel is connected to the Memorial City mall and walking distance from surrounding restaurants. The space is beautiful and meets all our conference needs! Don’t forget to check out the infinity pool on the 18th floor, it reveals stunning views of the Houston skyline. Dr. Johnny Robinson is the Assistant Director of Fraternity & Sorority Life at the University of Texas at Arlington since 2012. Johnny also serves as a University Hearing & Student Conduct Officer as well as Title IX Investigator for UTA. 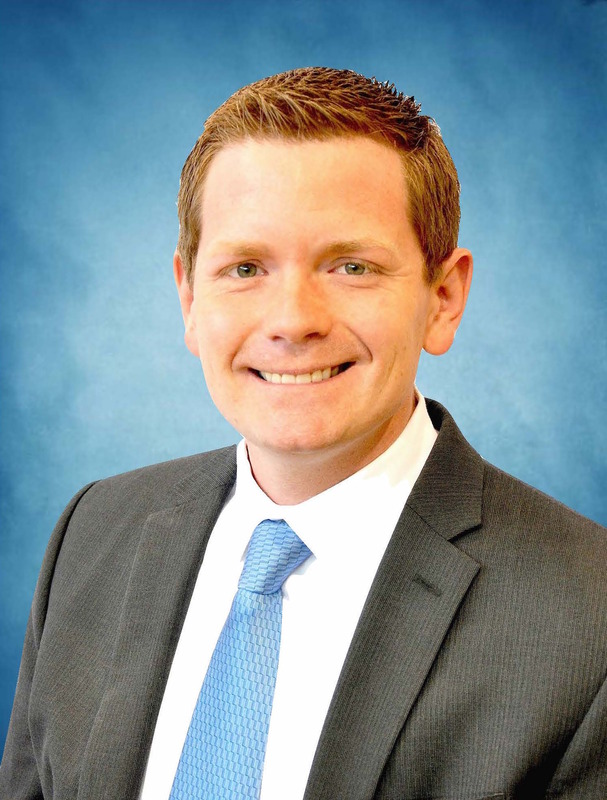 He has been a member of TACUSPA since 2006 when he began his career in student affairs at Tarleton State University. He has volunteered on the TACUSPA Conference Planning Committee in 2014 and 2018. He also serves on the Editorial Review Board for the TACUSPA journal, Student Affairs on Campus. He and his wife Kerin reside in Fort Worth, TX where they are avid sports fans and enjoy traveling. For over twelve years, TACUSPA has been the professional association that I have called home and has assisted in my continual development as student affairs practitioner. As a first generation college graduate, I struggled to find my place in the “real world”. After a brief time as a public school educator, I returned to graduate school and was encouraged to join TACUSPA, as I began to serve students within a student affairs setting. Since this time, the connections, mentors/mentees, and opportunities to learn and grow have been endless. When faced with problems on our own campuses or within our field, it’s beneficial to know that we can turn to our TACUSPA network and vice versa in times of need. I am also appreciative of the support through the TACUSPA Research Grant which has assisted my research interests; one which supported the completion of my dissertation. In a time when the student affairs landscape is continually changing, it is important that our professional associations support innovation and the implementation of new ideas of inquiry and research. Thank you TACUSPA for being on the forefront and a leader within our field by allowing all members the opportunity to share our work through conference presentations, webinars, publications, and networking amongst other members. I look forward for the opportunity to continue to give back and serve TACUSPA both currently and in the future. We want to recognize our amazing members for the great things they are doing in student affairs! Send your accomplishments to christine.self@ttu.edu for inclusion in the next TACUSPA Times. Ted Ingwersen, Texas State University, successfully defended his dissertation: Synergistic Supervision Strategies of Mid-level Professional in Student Affairs on March 8. Dr. Paul Eaton, Sam Houston State University, was pinned as an ACPA - College Student Educators International Diamond Honoree at the annual convention in Houston, Texas. Dr. Ricardo Montelongo, Sam Houston State University, was recently featured on the Teaching in Higher Education podcast about creating immersive learning experiences in online courses. Eaton, P. W., Pasquini, L., Ahlquist, J., & Gismondi, A. (March, 2018). Student affairs professionals on Facebook: An empirical look. Paper presented at the annual meeting of ACPA – College Student Educators International. Houston, TX. Self, R. N., Eaton, P. W., Lyons, K. N., Shipley, G., & Montelongo, R. (February, 2018). Online learning: Can it truly be rigorous and transformational? Panel presented at the annual meeting of the Southwest Educational Research Association (SERA). New Orleans, LA. Montelongo, R., Payton, J. M., & Eaton, P. W. (January, 2018). Critical digital pedagogy. Panel presented at the annual Digital Education Summit (DES). Huntsville, TX. Eaton, P. W., Arriaga, M. A., & Beeks, J. (January, 2018). Using SLACK and Hypothes.is in a graduate research course. Conference session presented at the annual Digital Education Summit (DES). Huntsville, TX. J.C. Stoner, University of Texas at Arlington, published an article in The Journal of College and University Student Housing titled “Revisiting Resident Assistant Burnout: Functions of Gender, Community Composition, Choice to Continue Employment, and Job Satisfaction”. Stoner, J. C. (2017). Revisiting resident assistant burnout: Functions of gender, community composition, choice to continue employment, and job satisfaction. The Journal of College and University Student Housing, 44(1), 30–46. Christine Self, Texas Tech University, received the Outstanding Professional Award from the American Higher Education Parent/Family Professionals (AHEPPP) organization in November. The conference committee has been hard at work over the past couple weeks and months to put together a conference you can be proud of and one in which you will find inspiring and reinvigorating. 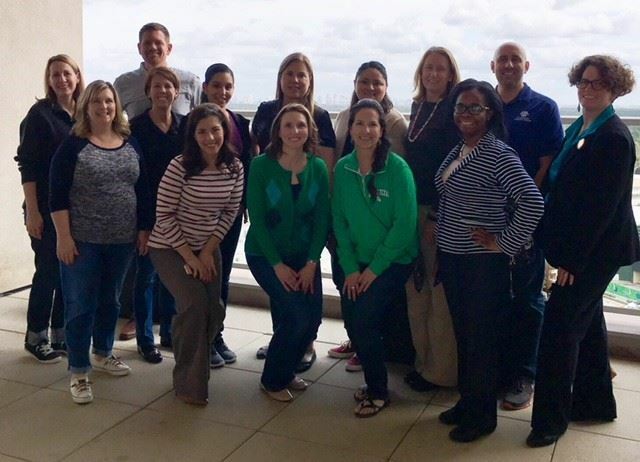 In January, we met with the TACUSPA Board at the Westin and toured the beautiful space at the Westin Memorial City. Unfortunately, it was a little too chilly to try out the rooftop infinity pool. We believe that you will enjoy the incredible meeting spaces and food options at and near the hotel, including the plenty of restaurants and mall across the street. We are incredibly happy to share the New Professionals Institute will be coordinated by Dr. Kristy Vienne and Mr. Max Walling at Sam Houston State University. The Mid-Level Manager’s Institute will be coordinated by Dr. John Kaulfus at the University of Texas Health Science Center at San Antonio. These two unique pre-conference institutes provide the respective attendees an opportunity to engage in conversations that are focused on their careers and professional development. We hope those who supervise professionals in these respective roles will strongly encourage their attendance at what will be phenomenal programs. The committee has also engaged in significant conversations about the graduate student experience and the ways in which we can be more intentional about the inclusion of graduate students in a conference that may be their first professional conference. We think you will be excited to see what is coming! The conference site is a constantly changing space and we hope you will stay tuned to http://www.tacuspa.net/Conference for more updates on registration, hotel rates, local attractions, and more. If you have any questions, please feel free to reach out to either Jamal or myself. For this newsletter, we are sharing insights from Sam Houston State University (SHSU) that we hope you will find interesting and inspiring for the work on your campus. And thanks goes to Dr Daughn Pruitt for this contribution. If you have something to share please feel free to email pshefman@central.uh.edu to be featured in a future assessment corner. Student debt continues to be of national concern. How to address those concerns and provide possible solutions through financial education is the primary focus of colleges and universities. In 2007, Sam Houston State University’s Division of Student Affairs began a Student Money Management Center developed and directed by Dr. Kristy Vienne. The current Director, Patricia Collins, has continued to cultivate the department resulting in national recognition for financial literacy education. Assessment of the students’ level of knowledge of financial management has been an integral part of the success of the department’s programs. 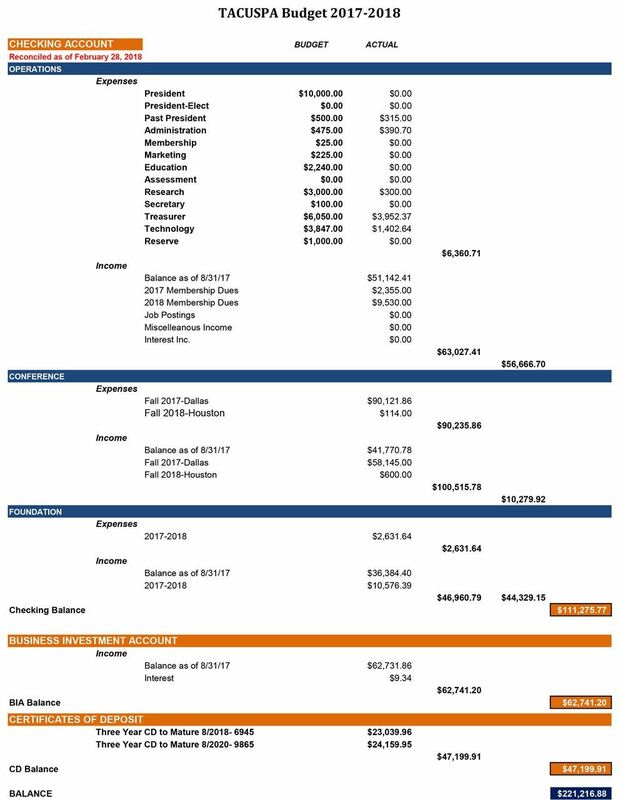 The Sam Houston State University’s Student Money Management Center (SMMC) assesses two primary services: 1) presentations in classrooms and workshops and 2) financial coaching sessions. Assessment for presentations use only an exit survey. Assessment for coaching sessions utilizes an intake and exit form. Although these are positive learning statements, they illuminate the fact that student-learning levels with regard to student loans are at a basic level. The SMMC Administrator review of the student responses indicates that student loan programming should continue and should include basic curriculum. Again, these statements are very positive learning outcomes. They indicate a basic level of understanding and the continued need for basic budgeting programming. Advanced financial programming on personal net worth, insurance and investments are offered and assessed; however, basic programming for student loans and budgeting are requisite underpinnings of a sound financial literacy program. In addition to a short answer response, both exit survey instruments use a Likert Scale for assessment. On the presentation survey, the Likert Scale assesses the SMMC events overall as well as the effect students’ finances are having on their ability to stay in school. The Likert Scale determined that on average, 48% of SHSU students surveyed agreed that their finances are affecting their ability to stay at SHSU and complete their degree. o Students’ ability to create and accomplish financial goals. The application of the Likert Scale to these items identifies whether or not the student is learning key elements necessary to become financially independent. Goal setting and learning how to achieve financial goals are essential components necessary to become financially independent and aggregate wealth. Self-reporting with regard to the mastery of these elements is an integral part of the assessment process. The program administrator’s review of these responses gives insight regarding programming or coaching strategies that might enhance student outcome. Assessment is a critical component to the success of financial literacy programming. Repeating the assessment, review, and implementation process is essential to the emerging product of financial literacy in higher education. It provides administrators with an avenue to determine what programming is timely and relevant to students at their campus. Student dynamics on campuses across the country will continue to evolve. As that evolution happens, we must urge administrators to turn to assessment to guide us in our efforts to provide the most timely and relevant programming for our campus culture. Being a single mother can be difficult, especially when a single mother has little or no income. Nationally, over 43% of households headed by single women with children live in poverty and over 56.7% of poor children lived with single mothers. (Hess et al., 2015; National Women’s Law Center, 2015). In Texas, 41.8% of female-headed households live in poverty (National Women’s Law Center, 2015). With these startling statistics, most federal and state programs only provide temporary assistance and do not help single mothers escape poverty long-term (Single Mother Guide, 2016). Nationally, an average weekly wage for women with a high school diploma is $578, while women with an associate’s degree earn $661 weekly, and women with a bachelor’s degree or higher average $1049 weekly (United States Department of Labor Bureau of Labor Statistics, 2015). However, roughly 18% of low-income single mothers do not have a high school diploma (Covert, 2014). Therefore, many of these women rely on government assistance to care for themselves and their children. Low-income single mothers have a desire to earn a living for their families, but a lack of credentials forces them to work low-wage jobs (DeBell, Yi, & Hartman, 1997). It is known that higher education can provide those in poverty an escape, this includes low-income single mothers (Graham & Bassett, 2011). Institutions of higher education are serving an increasing number of single mothers today, with 43% of parenting students being single mothers (Gault, Reichlin, Reynolds, & Froehner, 2014). However, just over 27% of single mothers complete a degree or certificate within six years of enrollment (U.S. Department of Education, 2010). With this growing population, it is important that higher education institutions examine the multiple barriers low-income single mothers face and collaboratively strive to help alleviate some of those barriers (Tiamiyu & Mitchell, 2001). There is limited research on effective programs and services that support low-income single mothers through postsecondary education attainment. Higher education institutions are continually working to retain and graduate more students. With the average completion rate of 29% for 2-year institutions and 59% for 4-year institutions many students enter college and leave with little more than debt (National Center for Education Statistics, 2015; Texas Women’s Foundation, 2014). The problem in the current study is the lack or limited availability of programs and services on college and university campuses for low-income single mothers to successfully complete a higher education. As higher education institutions continue to strive to increase retention and graduation rates, it is important that single mothers are considered in the programs and services that are offered at institutions (Graham & Bassett, 2012). Improvements in programs and services for single mothers can help these mothers continue and complete a postsecondary education (Graham & Bassett, 2012). In looking to increase the understanding and research around single mothers pursuing a higher education, the current study utilized a Delphi method to gather experts’ opinions about programs and services that are needed to support single mothers pursuing a degree in higher education. The current study invited 50 experts, professionals who have worked with single mothers pursuing a higher education for at least 24 months and single mothers who are currently pursuing or who recently completed a credential in higher education in the last 24 months, to provide their opinion about the current study topic. This was accomplished through a five-round Delphi study. The final results of the current study provided a ranking order for the categories of programs and services and also a top five selection of programs and services needed by single mothers to complete a degree in higher education. This information was utilized to build an evaluative scorecard for higher education institutions to review their programs and services for single mothers attending their campuses. Table 1, displays the final results of the Delphi Study. The need for research of this caliber is essential as by the year 2020, 65% of all jobs in the U.S. will require some form of postsecondary education (Carnevale, Smith, & Strohl, 2013). Current research shows that for many students having access to tutoring, mentoring, academic and career advising, TRIO programs as well as other services helps to ensure a holistic learning environment (Hayes-Nelson, 2009). While these programs are important, many of the participants in the current study felt that these programs were no different than services most other students need. The current study found that low-income single mothers need more specific services such as, class times available for working single mothers and child-friendly on campus study spaces. The current study also expanded beyond just social services for the mothers and included academic, family supports, and institutional programs and services that are needed by single mothers. In conclusion, the current study was timely due to the focus of previous President Barak Obama and Congress to increase graduation rates among college students (The White House, n.d.). It is important that single mothers be considered in this as they comprise 43% of the parenting student population on higher education campuses (Gualt, et al., 2014). Moreover, the current study is important to ensure that low-income single mothers obtain the credentials of a degree or certification that can help low-income single mothers earn a living wage (DeBell, Yi, & Hartman, 1997). Not only will an increase in wages help low-income single mothers and their families escape poverty, but also earning a credential will help the single mothers have higher self-esteem, be stronger leaders in their families and communities, influence their children’s educational goals, and positively change the dynamic of the family and demonstrate to their children that with hard work and dedication anything is possible (Graham & Bassett, 2011; McMahon, 2009; Miller, Gault, & Thorman, 2011; Tiamiyu & Mitchell, 2001). The results of the study can be used to increase retention rates of single mothers while also providing information for increasing retention rates for all students, especially disadvantage students. Covert, B. (2014). Working single mothers are disproportionately likely to be poor. Gault, B., Reichlin, L., Reynolds, E., & Froehner, M. (2014). Institute for women’s policy research: Fact sheet. Retrieved from http://www.iwpr.org/publications/ pubs/4.8-million-college-students-are-raising-children. Graham, M., & Bassett, M. (2012). Low-income single mothers at community college: Recommendations for practices to improve completion. Retrieved from http://womenemployed.org/sites/default/files/resources/LowIncomeSingleMothersatCommunityCollege2012.pdf. McMahon, W. W. (2009). Higher learning, greater good: The private and social benefits of higher education. Baltimore, MD: Johns Hopkins University Press. Miller, K., Gault, B., & Thorman, A. (2011). Improving child care access to promote postsecondary success among low-income parents. Retrieved from http://www. iwpr.org/publications/pubs/improving-child-care-access-to-promote-postsecondary-success-among-low-income-parents. Tiamiyu, M. F., & Mitchell, S. (2001). Welfare reform: can higher education reduce thefeminization of poverty?. Urban Review, 33(1), 47-56. United States Department of Education. (2010). Profile of Undergraduate students: 2007-08. Within the expansion of globalization, there have been numerous theories seeking to explore potential improvement strategies for university student retention. Findings and research have discovered that a culmination of non-academic and academic factors contribute to an increased retention rate within universities. Self-efficacy is merely one of these factors, which plays a substantial role in a student’s coping ability, thus increasing self-confidence. This article seeks to explore the foundations of what could serve as an institutional model for retention based on non-academic factors, academic factors, and self-efficacy. Globalization has attracted individuals to postsecondary education, as it is necessary to remain economically competitive. Yet, a need remains in order to enhance retention rates through the development of tailored and complex plans and programs. Educational policy leaders such as Veronica Lotkowski, Steven Robbins, and Richard Noeth have explored the need for retentions programs, which address both non-academic and academic factors. (Lotkowski, Robbins, & Noeth, 2004) have indicated in their studies that the non-academic factor of academic-related skills, academic self-confidence, academic goals, institutional commitment, social support, certain contextual influences, and social involvement all had a positive relationship to retention. In addition to the possession of necessary skills, the improvement of one’s self-efficacy produces a higher rate of desired effects, thus positively influencing a student’s success. In Cindy Veenstra’s article reviewing a strategy for improving freshman college retention, it was found that education leaders such as Vincent Tinto have indicated that we are in dire need for an institutional model for helping students succeed. According to the article, what is needed and what is not yet available is a model of institutional action that provides guidelines for the development of effective policies and programs that institutions can reasonably employ to enhance the persistence of all their students (Veenstra, 2009, p.6). While college students emerge into the university setting with varying personality traits, backgrounds, and goals, the institutional action may call for additional student support activities which include both non-academic and academic measures. The transition into the university setting has been widely studied for many years as orientations, freshman seminars, and additional extracurricular programs have been implemented in order to improve the introductory experience. The thought of reinforcing student involvement outside of the classroom was a notion driven by student affairs professionals who sought to provide their universities with retention activities and programs. (Tinto, 2007) described this early work on retention as the “age of involvement” which rushed into service a range of programs to enrich the freshman year experience ranging from expanded and extended orientation to a variety of extracurricular programs. As a result, these infant programs lacked complexity as they failed to consider the experience of students as well as the students varying in gender, race, ethnicity, income, and orientation. As critical as these non-academic factors are, the importance of academic student support services must not be ignored. (Veenstra, 2009) expressed the need for additional resources including tutoring, mentoring, and advising in combination with faculty involvement. Literature supports the need for intensive assistance in addition to an ongoing program that occurs early in the first semester. As this culmination of non-academic and academic factors collide, there remains one factor which has been proven to influence one’s success. (DeWitz, Woolsey, & Walsh, 2009) expressed the struggle to incorporate the opportunity, the means, and the motivation. Self-efficacy was the one common denominator found in successful individuals as it is notably defined as the levels of an individuals’ self-confidence. The correlations between self-efficacy, goal orientation, and an individual’s coping skills all relate to increased levels of success. In order for a student to persist through adversity and persevere to achieving his or her college degree, he or she must actively feel a sense of meaning, become determined to set goals, and connect to the institution and to those around them. While high school GPA is a predictor of college success, several studies have shown student motivation to be a strong predictor of persistence (DeWitz, et al., 2009). Personal efficacy expectations are expected to impact behavior, how much effort will be applied to attain an outcome, and the level of persistence devoted to overcoming hindrances (Devonport & Lane, 2006, p. 127). Developing a ‘sense of belonging’ is critical to the success of college students, particularly for the retention of students who are considered to be at risk of non-completion (O’Keeffe, 2013, p. 4). The development of an individual’s feelings of purpose in life certainly correlate to the value found in self-efficacy. Researchers studying students, who considered leaving college, found that many of these individuals described dissatisfaction with their college social life and experiences (DeWitz, et al., 2009). While the interrelationship between purpose of life and self-efficacy exists, the parallel between self-efficacy and coping may be even more profound. One strategy seeking to enhance self-efficacy is to consider the way in which students cope with stressful encounters (Devonport & Lane, 2006). There are many ways in which students may choose to cope, and responses to stress may include venting, positive reframing, denial, etc. Several studies lend support to the idea of creating interventions based on self-efficacy theory to positively influence behaviors that improve or augment students’ subjective sense of purpose in life (DeWitz, et al., 2009, p. 11). With this complexity of student retention comes the range of models, including sociological and psychological factors in nature that have been proposed to the task of explaining student attrition (Tinto, 2007). As higher education models for retention are created, student affairs professionals and faculty alike must seek to create a welcoming environment where care, warmth and acceptance are promoted, in order to achieve improved student retention (O’Keefe, 2013). Furthermore, coping strategies such as cognitive and secondary appraisal should be highly encouraged among those who influence students. Just as self-efficacy has been linked with success, active coping methods have been linked with higher self-efficacy rates among individuals. Within the realms of academic factors regarding faculty and staff development, it is increasingly clear that faculty actions, especially in the classroom, are critical to institutional efforts to increase student retention (Tinto, 2007, pg 7). While we unfortunately do not know the specific ways in which varying development programs impact student attrition, we do know the significance surrounding faculty teaching methods. Additional support including supplementary resources and professional development opportunities may be included in a model of institutional action. In moving toward success with this issue, it is apparent that student retention is a highly sought after topic in higher education. The increased number of students attaining undergraduate and graduate degrees has flourished, and with this advantage comes a matter of contention. The need for a multi-layered model for student retention is illusive, but not discovered. Academic factors including tutoring, mentoring, and advising must not be ignored, while non-academic factors including counseling or facilitating welcoming environments inside and out of the classroom are equally as vital. Finally, opportunities presenting coping strategies must be made apparent and accessible to all students within the model and plan. Additional research in the areas of self-efficacy beliefs and associations could provide valuable information for those seeking to improve the lives of students in higher education (DeWitz, et al., 2009). Veenstra, C. P. (2009). A Strategy for Improving Freshman College Retention. Thoughts and experiences of educators related to quality and change, 1-23. Retrieved January, 2009, from https://static1.squarespace.com/static/51fafa0ee4b0d906af53ce83/t/521dfdffe4b0912f523f841e/1377697279293/JQP article long.pdf. The TACUSPA Newsletter is edited by Christine Self, Associate Director of Parent & Family Relations at Texas Tech University.